When you have a tooth that has become too damaged to function, or has been lost due to disease or injury, a replacement tooth is the best possible solution for your continued good oral health. The immediate loading of implants to replace one or more missing teeth provides you with a new tooth more quickly than other dental solutions. 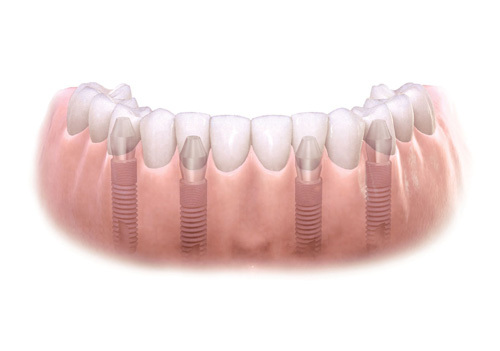 Dental implants have been used for many years to replace one or several missing teeth. When one tooth is missing, a bridge is also a common treatment. With a bridge, a new tooth is attached to the natural teeth on either side by means of a support, or bridge that secures it between the other teeth. Dental implants provide more stability than a bridge because the new tooth is secured in place by attaching it to the bone below. Immediate loading of implants provides you with a secure replacement more quickly. In delayed dental implants procedures, the bone is prepared for the implant but then requires several weeks to heal before the two can be attached. With procedures that allow the immediate loading of implants, the bone heals after the tooth is in place, lessening healing time and office visits. It is important to replace any missing teeth as soon as possible to avoid these problems. The immediate loading of implants procedures allows for the best possible solution to avoiding these types of problems and the need for dental work in the future. Contact your periodontist if you have any of these issues.